Rytne Gård (Rytne Farmstead) offers fantastic views over Dalsfjorden! f you are looking for accommodation during the festival, it’s important to contact the hotel or location directly instead of trying to book accommodation on internet. As a guest, you will find a range of fine places to stay in Førde, Vassenden, Skei, Naustdal, Florø, Sande, Skilbrei and Bygstad, all of which are only 15 – 55 minutes from Førde. Several places offer help with transport; just ask at the reception. While some of the places to stay are situated a little outside Førde, they offer a chance to combine outstanding scenic and other holiday opportunities with the festival. 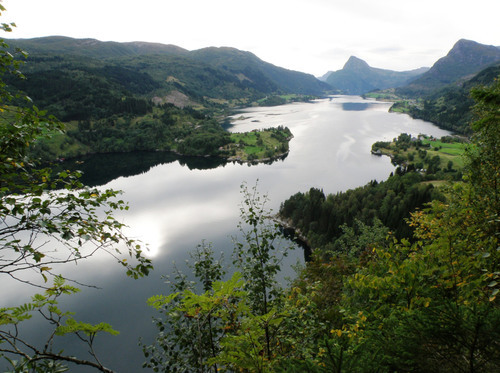 See the web pages of the Sogn og Fjordane Tourist Association or the Norwegian Trekking Association for hiking trips in Sunnfjord. Looking for private accommodation? Try AirBNB or Finn. We advise everyone trying to rent, or rent out, a room, house or cabin in the Førde area during the festival to do this through Finn or AirBNB. To make your ad easy to find, it’s a good idea to include “Førdefestivalen” in the title. Scandic Sunnfjord Hotel & Spa - the festival hotel. Please see Fjordkysten for more offers of accommodation in Sunnfjord and along the coast.